The Orpington is a dual-purpose chicken breed, raised for both eggs and meat. Developed in Orpington, Kent, England, it was bred specifically to produce superior eggs while still maintaining good meat quality. Several different color variations exist, including the common buff Orpington, and there are both full-sized and bantam varieties available. The Orpington chicken is a good all-purpose utility chicken, providing both eggs and meat, but it is frequently bred for show. Breeding for show is so common that the egg production of this chicken has fallen slightly over the years as breeders emphasize appearance overproduction. The Orpington is a friendly breed that also makes a good outdoor pet for families, schools, or clubs. The Orpington was first bred by William Cook in 1866 by crossing Minorca, Lanshan, and Plymouth Rock breeds to produce a hybrid. Initially, Cook bred a blackbird aimed at hiding the grim of air polluted by London factories, but other colors soon proliferated. Today, the buff color is the most common. The bantam version of the Orpington was developed in Germany in the early 20th century. Mature Orpingtons are large, heavy birds, weighing in at 7 to 8 pounds. Bantams range from 3 to 3 1/2 pounds. Orpingtons are big, gentle birds that respond well to attention. They are non-aggressive and enjoy handling, making them a good bird for families. Because they are passive birds, they do not do well in mixed flocks that include aggressive breeds, such as Rhode Island Reds. Orpingtons are relatively quiet birds that do well in city or suburban environments. They are great with kids, making them a good choice for 4H projects or schools. Orpingtons do not mind confinement and respond well to the transportation and handling that goes with competitive showing. Hens brood easily and make good mothers. A small flock of Orpingtons can easily be maintained over a long period. Roosters of the species are unusually gentle. 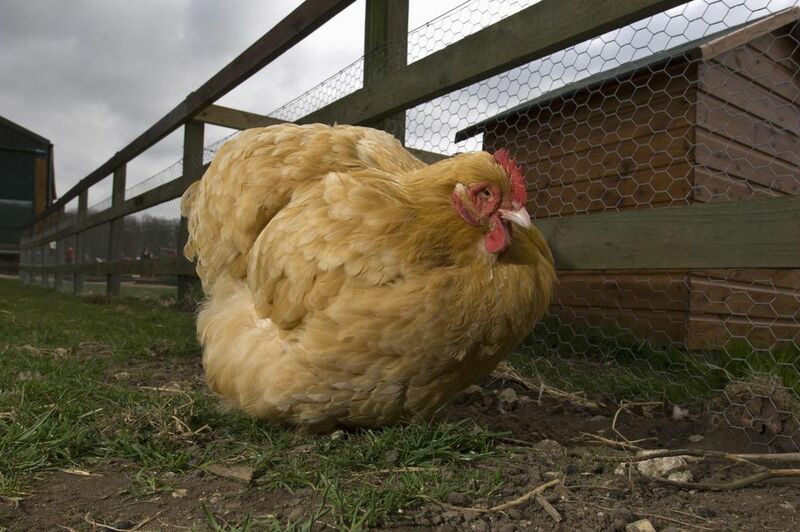 The Orpington has a heavy, broad body with a low stance. The broad, smooth feathers are fluffy, and the back is short and curvy. There are several common color varieties, including buff, black, blue, white. Buff is the most common color variation; other colors may be hard to find. The beak, feet, and legs are pinkish white in color, and the eyes are reddish brown. The wattle, comb, and earlobes are red. The comb generally has five points. Orpingtons are a heritage breed—one that existed before modern industrial meat and egg production. Many small farmers find heritage breeds to be hardier and healthier than their industrial, hybrid counterparts, and they tend to exhibit more classic chicken behaviors such as foraging, dust bathing, parenting their young, and sometimes going broody. Orpingtons are also very cold-hardy and lay well through frigid winters and dark, short days. They are large birds with thick feathering that helps keep them warm and toasty through the winter months. They are good birds for cold climates, but can also tolerate heat if they are given shade during the hottest part of the day. An Orpington hen lays 200 to 280 large brown eggs per year. If raised for meat, the birds are ready for the table after about 22 weeks. Orpingtons thrive in the cold, but very warm temperatures can kill them unless they have shade and good ventilation. Orpingtons have dense feathers that can collect lice and mites—regular application of poultry dust can keep pests in check. Large birds, Orpingtons can be prone to obesity unless they get ample exercise. Or consider any of the other chicken breeds commonly raised.